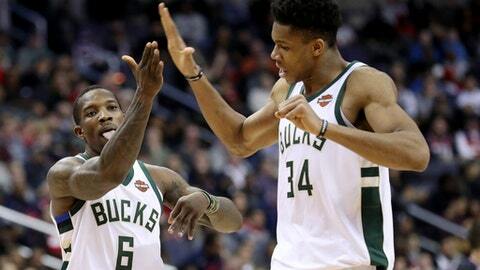 WASHINGTON (AP) Giannis Antetokounmpo and Eric Bledsoe led the Milwaukee Bucks to victory. Matthew Dellavedova was the one who really got the Washington Wizards’ attention. Antetokounmpo had 34 points and 12 rebounds, and Bledsoe scored 15 of his 21 points in the fourth quarter of Milwaukee’s 110-103 victory Saturday night. But it was Dellavedova who left Washington steaming after a fourth-quarter flagrant 2 foul on Bradley Beal that resembled a football tackle and threatened to spark a brawl. As Beal drove the lane in transition, Dellavedova reached out his arms. The right one caught Beal around the neck and brought him to the ground. ”I was just trying to hold him to prevent him from, you know, getting the and-one, and then he just went to the ground,” said Dellavedova, who received his first career ejection. Beal finished with 20 points, and John Wall added 16 points and 16 rebounds for Washington. But the pair shot just 1 for 9 in the final 7:24 after Dellavedova’s dismissal. Khris Middleton had 20 points, and John Henson added 11 points and 11 rebounds for the Bucks, who secured a fourth win in six games and snapped Washington’s four-game win streak. Milwaukee closed the game on a 12-4 run to help erase some of the sting of a blowout loss to Toronto a night earlier. Antetokounmpo hit a running layup to put Milwaukee up for good, 100-99, then followed with a baseline jumper to stretch the lead to three with 1:44 left. Bledsoe’s step-back 3-pointer made it 105-101 with 1:17 to play before Antetokounmpo’s last jumper stretched the 108-103 with 36.2 remaining. Antetokounmpo has at least 20 points and five rebounds in 27 consecutive games. That’s the longest such NBA streak since Shaquille O’Neal matched it during the 2000-01 season. While Antetokounmpo and Bledsoe spurred the offense late, Milwaukee’s defense held Washington to 5 of 19 shooting. Beal could also face some discipline from the NBA for his actions in the brief scrum that followed Dellavedova’s foul. Replays showed Beal’s hand had made contact with referee Kevin Scott’s shoulder and neck area as he stepped at Dellavedova. Wall said his own impressions of Dellavedova don’t quite match the record of four flagrant fouls in five NBA seasons. ”Whatever their team can say and other people can vouch for him, to me, I always thought he was a dirty player,” Wall said. Bucks: Kidd elected to give G Malcolm Brogdon his 11th start of the season Saturday and bring G Tony Snell off the bench. . All three of Dellavedova’s previous technical fouls came in the 2015-16 season with Cleveland. … The Bucks are 5-3 in the second of back-to-back games. Wizards: Swingman Otto Porter sat out with a strained right hip. … With 17 points, C Marcin Gortat hit double figures for the second time in three games after surpassing 10 points in only four of his previous 20 … The Wizards dropped to 4-2 in the second of back to back games. Bucks: Close their two-game road at Indiana on Monday night. Wizards: Continue their homestand Wednesday night against Utah.